One of the tasks I found most difficult when I first became a High-Tech Anthropologist® at Menlo Innovations was the volume and speed at which those around me were processing and making sense of data. First: the overwhelming volume of data. Everything was captured, from the layout of physical space to personal attributes of the people we were chatting with. It seemed every detail was noticed by my peers, and then remembered and shared as the project moved forward. How on earth did every particle of data remain in these HTA’s heads? But there was a need to move quickly: we were working on a client’s project, using their hard-earned dollars for every leisurely second I wanted to waste on introverted reflection to satisfy my worry that every detail was captured. And what more was I really going to derive by staring at my notes for an extra hour, day, week? That’s when I learned the deeper value of a tool called “mind-mapping” which, at Menlo, was a tool we (as per usual) stole from someone else: Tony Buzan and then adjusted to suit our needs. Mind-mapping, at its most basic, is a visual note taking technique used to organize thoughts. At Menlo, we use a stepped process that ensures no details are missed and that data gets quickly organized for the team’s reference later. We start with a pair of High-Tech Anthropologists® attending each and every user interaction. Two sets of eyes are far better than one, especially when gathering detailed data that will drive a project to success or failure. We give each HTA the freedom to capture notes in whatever way makes the most sense to them. But once we begin debriefing, our process becomes more uniform. 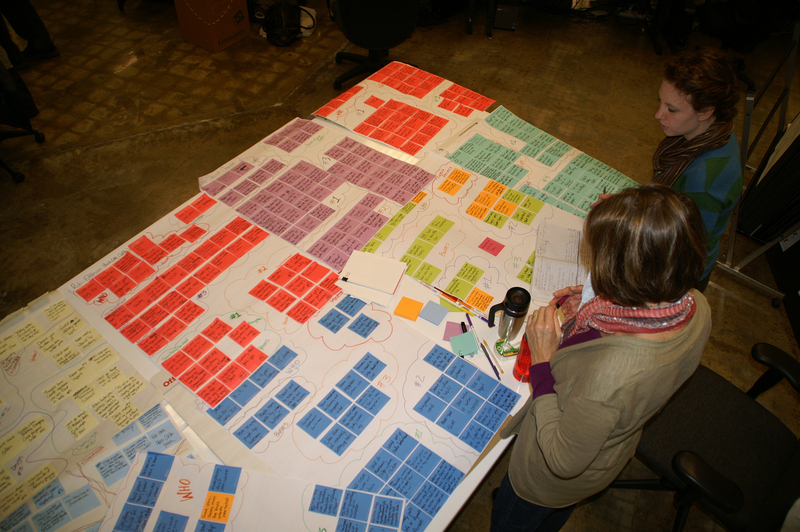 We debrief every thought, note, step, detail onto individual sticky notes so that we can begin moving them around and bucketing them in whatever way makes the most sense for the data gathered. Our process allows us to be extremely flexible within the rigors of our method. Those buckets then translate into the groupings on our mind map. As we work through this process, you’ll notice we’ve now reviewed our and our pair partner’s notes not once or twice, but three times once we get to the point where we are creating a mind map. It is this pivotal, yet subtle, point that I think drives so much of our speed and our long-term memory. We are handling every fact with a critical eye, both within and free from the context of the interview, and creating not only a mental but a physical organization of the information. And we’re doing this several times over in rapid succession. In addition, we are not just re-writing facts over and over, we’re drawing pictures to represent the data. Images are processed 60,000x faster than words and begin to illustrate the story of the interview. Which are you more likely to remember: an angry face accompanied by a quote relaying pain about a system? Or a fact relating the workaround used? 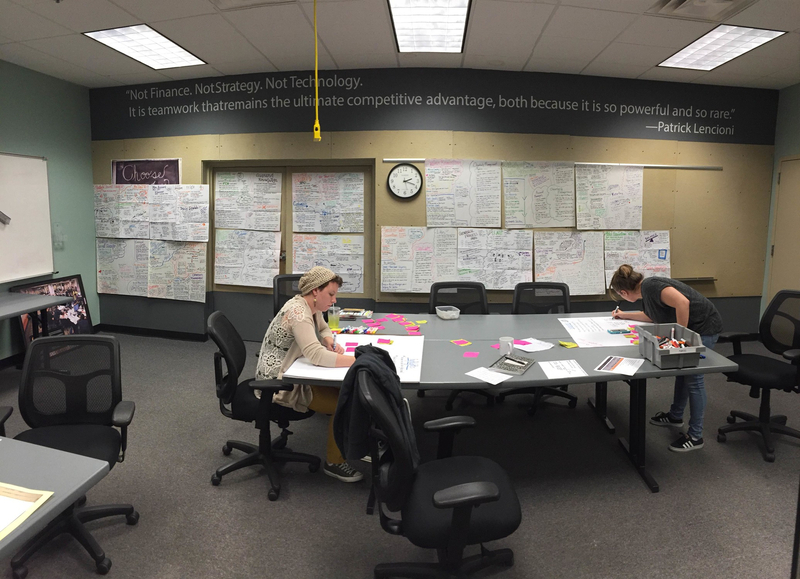 Which one inspires you to make a user-centered change? In addition, visuals cement those stories in our minds, so that a brief glance at the small doodle triggers a flood of memories. These images, combined with the data we’ve handled so frequently directly after the interaction ended, means stories, facts, and details persist in our minds and carry forward the project, ensuring the most vital information drives the necessary change without spending weeks or even months on analysis.